Made with 100% pure maple sugar. The age-old flavor of sweet maple sugar is combined with the zest of black pepper to create an exciting new taste for ham, chicken, fish, game, vegetables, soups, salads and eggs. 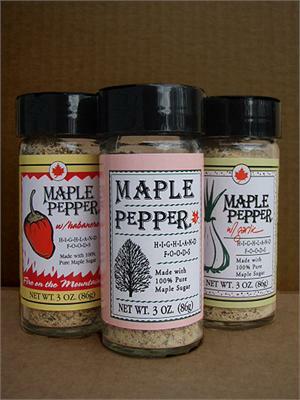 For the garlic lover in all of us, Highland Foods brings you Maple Pepper® Brand Seasoning with Garlic . We've taken the original recipe for our Maple Pepper®Brand Seasoning and combined it with the distinctive taste of garlic, to create a condiment that will impart a richness and ineffable flavor to many of your favorite foods. Shake it on meats, poultry, and fish before and after cooking; sauces and stews; soups; sandwiches and salads. combines this deliciously hot chili with our wonderfully distinctive Maple Pepper® Seasoning to bring you a condiment that ignites your favorite foods with a spark of sensational flavor. It adds fervor to south of the border dishes such as tacos and burritos, and is a stimulating addition to poultry, meat and fish; soups and salads; vegetables and eggs.